FACILITIES: Open plan sitting/dining room with French windows leading to south facing terrace, mezzanine twin bedroom, fitted kitchen with modern appliances and fittings, bedroom with French windows leading to terrace and twin beds which can be made into a double, modern bathroom with bath & shower. Floors are tiled on the ground floor and wooden on the mezzanine. All windows are double glazed. Village parking five minutes’ walk away. This recently renovated stone built cottage is situated in the heart of the oldest and most sought after part of Olargues with stunning views – a stone’s throw from the 12th century chateau. The pedestrian access is via a steep, narrow path, 5 minutes from the nearest car park. 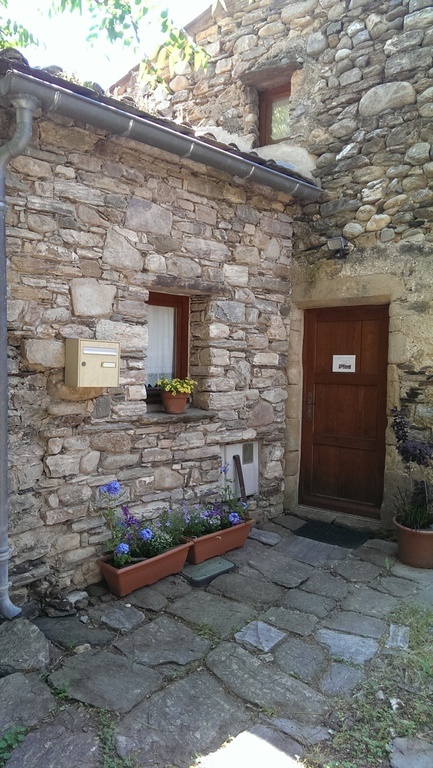 The cottage sleeps 4 people comfortably and is situated off a very quiet and pretty cobbled street in a small square known as La Place de l’Arbre Tort (Twisted Tree Square.) This was the original village market square when the Seigneurs d’Olargues still lived in their stronghold chateau until the 14th century. 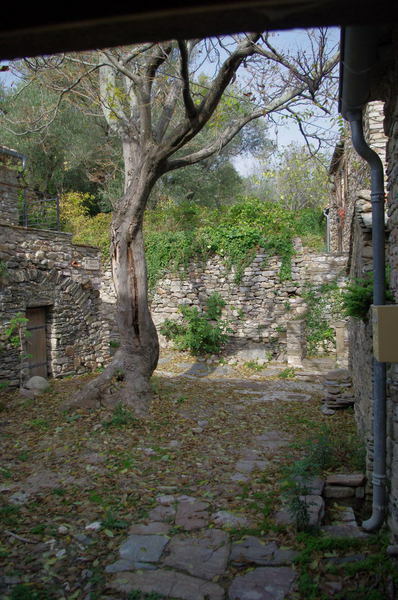 In safer times they moved further down into the village to inhabit La Maison des Seigneurs. The twisted oak tree at the centre of the small square is so old that it is protected by heritage laws. This jewel of a cottage is built on the rocky flanks of the hill. The sportive trot from the car park is rewarded by the complete absence of traffic and utter tranquillity of the location. There are a few other pretty stone cottages in the immediate vicinity, but otherwise this ancient location has many ruins and interesting remnants of the original dwellings abutting on to the chateau. The cottage is mostly on the same level and has a double bedroom, a mezzanine floor with twin beds, a lounge/dining room, modern fitted kitchen, bathroom and large terrace. 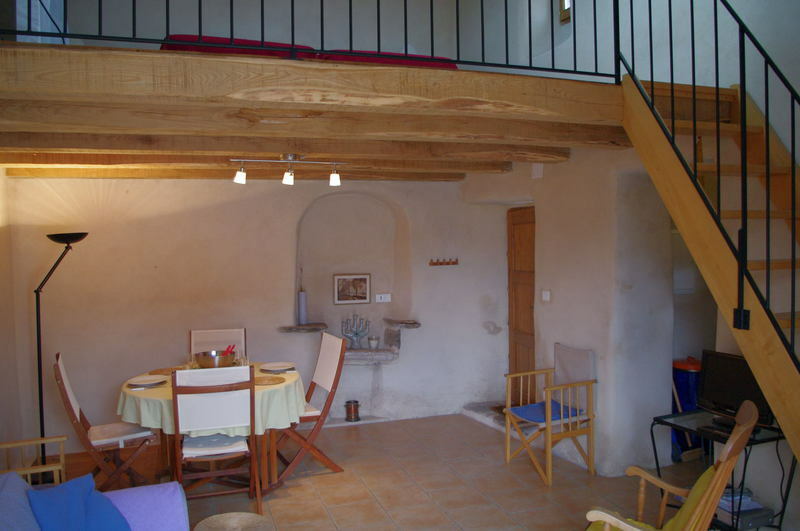 It has been recently renovated to a good standard, whilst remaining sympathetic to the Languedocian style of rough plastered natural coloured interior walls, solid wooden doors and exposed wooden beams. The original stonework of the interior has been preserved in several places. The original evier made from local St Pons marble has been made into an interesting niche feature near the entrance. The design of the renovation gives a sense of space and compactness at the same time; with each area leading harmoniously to the next. The grouping of the main rooms around the large terrace affords plenty of light to the interior and provides pleasant views to the exterior. The interior design is modern, light and uncluttered with the stone and wooden materials given centre stage. On arrival you come straight into the spacious (16.1 m²) lounge/dining room with glazed French doors leading directly onto the sunny terrace. This room has a dining table & chairs plus a rocking chair, sofa and wood burning stove. A TV and DVD player are also located here. English and French digital T.V. are available as well as internet access via WI-FI. A open tread staircase leads up to the mezanine floor above (9.2m²) with twin beds, which can be made into a double bed if desired. A glazed sky light makes this area light and airy and allows a clear view of the enchantingly blue skies over Olargues. This floor may not be suitable for elderly people due to the open tread staircase. There is a wrought iron guard rail along it’s length for safety. A well-equipped fitted kitchen (6,3m²) is situated to one side of the lounge with a modern bathroom (2.4m²) further along the corridor leading to the double bedroom. This pleasant double room (8.9m²) has large glazed French windows leading directly onto sun terrace. The room provides a cool haven from the heat of the summer sun whilst remaining light and airy. The large built-in wardrobe and cloth covered free standing cupboard provide ample storage. 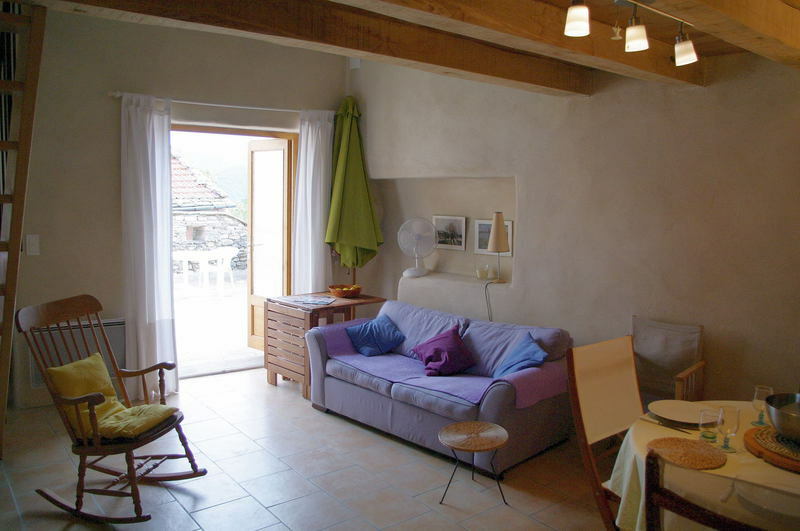 The sunny terrace (21.6m²) provides a special bonus to the amenities of Twisted Tree Cottage. It is bordered by an attractive stone built wall for privacy and paved with local flagstones. 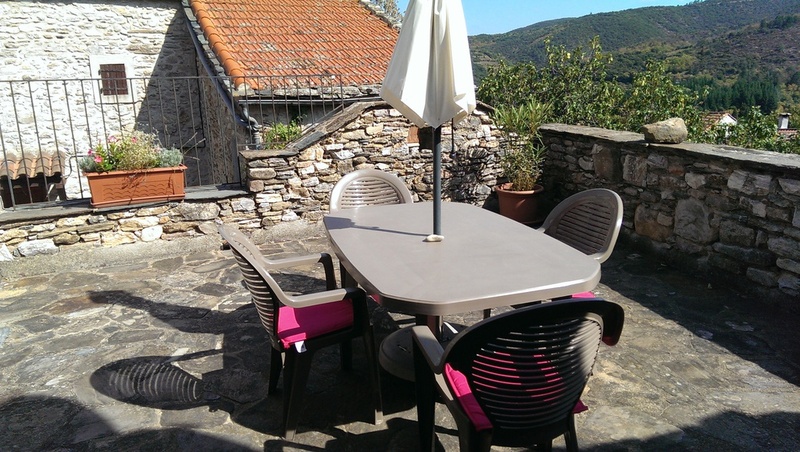 The terrace affords stunning views over the red roof tops of the village and the range of mountains called the Avant Montagnes, which rise up from the coastal plain to the valley where Olargues is situated. This is an ideal spot for sun bathing, relaxing and al fresco dining and, of course, the evening aperitif. A large modern barbeque and garden furniture are provided here. Twisted Tree Cottage provides a simple but comfortable holiday home with plenty of character. 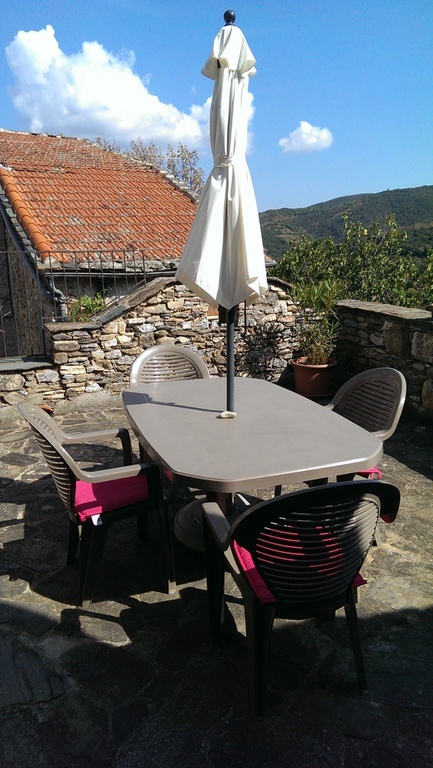 This is a fantastic place to find respite from all vehicle traffic and the business of modern life, whilst having access in short walking distance to the village services of Olargues. You can also wander up to the chateau using the path hewn out of the rock face by the original medieval inhabitants. 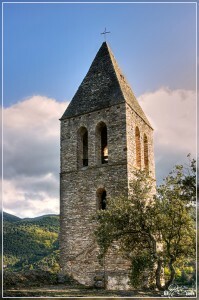 The walk up to the castle ruins is rewarded by magnificent 380° views over the surrounding countryside. As twilight falls enjoy watching the house martins swoop amongst the ruins looking for their evening meal. Linger to enjoy the lovely sunsets over the northern mountain tops before returning to the cottage’s terrace to catch the last rays as they fall behind the Avant Montagnes. Twisted Tree Cottage is a dream location for a peaceful holiday. 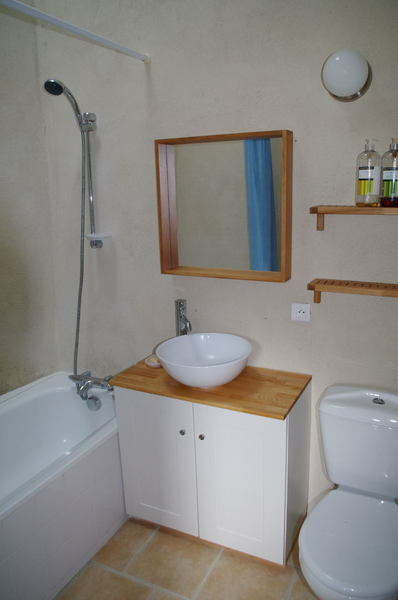 The cottage is equally suitable for adults and children. At hand there are as many outdoor activities as you may wish to try. Otherwise enjoy the magnificent views and relax completely in the comfort of this pleasant house. The cottage is on mostly on one level with access to the upper mezzanine floor via an open tread staircase, which may make it impractical for some elderly guests. The path from the car park is steep but short. Sorry – no smokers. 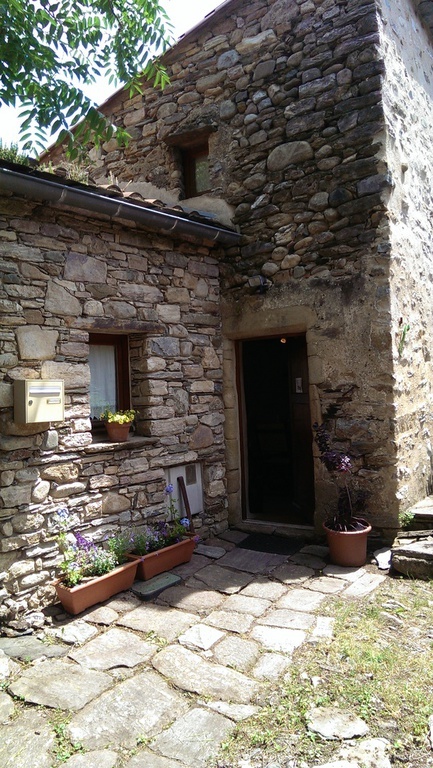 Enjoy the peace and quiet of this pretty and comfortable cottage surrounded by the history of the Cathar period!